The year started out really bad. Heath Ledger passed away. This was one of those moments where I remember exactly where I was when I found out. I was sitting at the computer at lunchtime listening to the midday news. They said something about how news was just breaking about the passing of "young actor Heath Ledger". It didn't really register in my head, because I thought he was just mixing up Heath Ledger's name with some other news story. I searched it up on the internet, and there it was. I was so distraught - it was probably one of the first deaths of a famous person that truly shocked me right through to the core. To this day it hasn't really sunk in that he's gone, but the world lost a truly gifted actor that day. Those holidays I saw some really cool movies that stick with me right up to this day. Waitress was one of them - I have a thing of watching that film when I'm sick. Which wasn't a good idea because I'd always get so hungry from it. Those pies looked so good. Enchanted was another one, which introduced me to Amy Adams and boosted my love for James Marsden. Oh yeah, the "love of my life" in 2008 was James Marsden. I look back and go "yes, I made the right choice there". Seriously, how could you not love this guy? He's so charming in both Hairspray and Enchanted. And a little stupid, but hey, that was really cute. I did get a movie called Heights out (this was back when Blockbuster had like, every movie), and I was totally shocked that it turned out that his character was gay at the end. I mean, I had Brokeback Mountain, and now this? Haha. My Hairspray obsession was still going in this year. Going strong, I should add. When you're year eight, you get the opportunity to be a school leader. Now, I really wanted to be head girl. Really. So I thought it would be a good idea to put in my speech that I wanted to make our school production Hairspray. The teachers actually laughed at me. Jeez. I mean, it wouldn't have been feasible with such a small school, but anyway. I didn't end up getting head girl...I got to be a freaking sports leader. Me. I guess, back then, I was in the top netball team and I was the fastest girl in the school when it came to 100m sprints. But still, if you saw me back then I didn't exactly scream "sports leader". The reason why 2008 was so great was because I had a teacher who actually encouraged my movie watching. Now, my teachers used to discourage everything I liked. Yeah, I know I was far too obsessed with horses. But they literally told me off every time I did something vaguely connected to horses, so I had to pretend that I liked cats. This teacher encouraged me to make posters with my (extremely bad) film reviews on them. She asked me about the films I was watching. She particularly encouraged me to look at classic films, which I did. One thing that helped my love for classic films was a book I bought the day I saw 27 Dresses (I was in love with James Marsden so don't judge) called "501 Movie Stars". It is basically a catalogue on all the greatest movie stars ever, which is sorted out in chronological order according to the star's birthdate. Lemme tell ya, I never went past the 1930s. I was obsessed with all of the stars from before then. They had these little quotes in them, which I turned into this whole essay about how it sucked to be in Hollywood at the time. That essay seemed a little sinister, since it was all about how they died...probably not the best material to put up on a classroom wall, but it went up there anyway. I saw Gone with the Wind in 2008! I remember it very well. As most of the classic films weren't at Blockbuster, I had to buy them. After a parent/teacher interview, I conned my mother into buying me Gone with the Wind because I was so good. I sat down to watch it on Good Friday. I literally had no idea that it was four hours long. Or that the disc was double sided, not just really cheap looking. Good thing I got the right side, huh? I thought it was just ending really abruptly, and it took me five minutes to register that I had to flip over the disc. It was a life-changing moment to see that double sided DVDs existed in our world. Still, I completely loved the film. Because of this love, one of my friends watched it, but he watched it the wrong way around, haha. Us Dannevirke people...double sided DVDs are so out of this world to us. Cue the love for Vivien Leigh. I was obsessed with Mamma Mia! for a while. Don't judge. I used to sing along to the soundtrack a lot. I actually still do. On a totally un-related note, my horse Katie won two races that year. Those were the happiest days of my life. 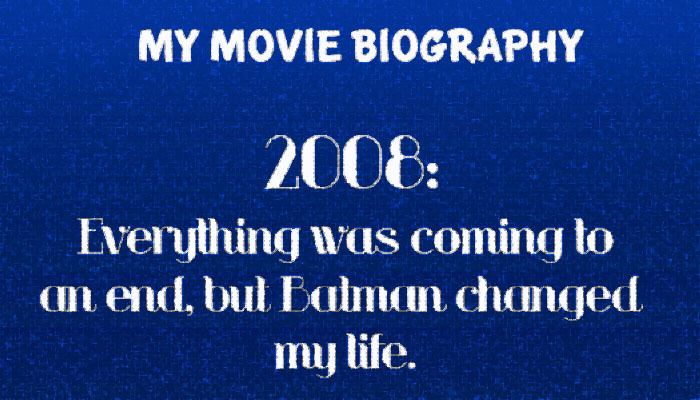 Possibly the most life-changing thing of 2008 (and there were a lot) was when I went and saw The Dark Knight. I didn't realise it then, but I realise it now. I had seen the trailer before Get Smart, read many articles about it through Empire magazine, knew that Heath Ledger was in it - but I didn't bother to see Batman Begins. Not until June 2010, in fact. My friend and I decided that we REALLY wanted to go and see it. The only free nights were either the night where we were being shown around the high school, or the night after, which conveniently had a storm that made it quite dangerous to go over to Palmerston North. We went for the latter. My mother told me that I wasn't allowed to go, and I was really upset about it. REALLY upset. Eventually she caved and The Dark Knight was a go. That day we told our teachers how excited we were, and they just replied "oh, I hear that movie is REALLY violent and not suitable for kids." LOL. It was blowing a gale and pouring down with rain, but we made it over there. I sat down in that cinema with no idea of what to expect. I thought superhero movies were all cheesy. The Dark Knight was the complete opposite. Now, I admit that I didn't fully understand this film in that viewing. I was too wound up in Heath Ledger's performance. I had never seen anything like it. It was the first movie I'd seen that really filled up a cinema - by that I mean that the chairs were vibrating from how loud the sound was. I was so invested in this movie, too - it was the first time I'd experienced losing myself in a movie. The way it ended had a particular effect on me, too. At age 12, I'd been inadvertently introduced to the man who would become my favourite director. And I truly mean it when I say that (this ain't no Tarantino situation). The only bad thing about that situation was that I needed to go to the toilet for the entire time. And The Dark Knight is not a short movie by any means. I think I just about threw up afterwards. Gee, thanks, Nolan. Not a lot happened for the rest of that year, apart from my love for Vivien Leigh. Which led to a 100 page biography/project on her. The biography was a smaller, concise version of one of the biographies of hers that I read. One day I might share it with you, if I can find all of it. It is actually quite good, if I do say so myself. Other than that, not a lot happened for the rest of 2008. I was basically just getting ready to leave primary, which I was terrified of doing. It seems so stupid now, because high school is ten times better than primary. I should be more terrified of going to university. Those last days went really fast. We tried to make our whole class watched The Dark Knight, but only a select few of us kept watching it. I made an end of year speech which everyone seemed to like. I didn't get dux (top of the class), which is one of the biggest disappointments of my life (haha, what a sad life I lead). I ended the school year with Miss Pettigrew Lives for a Day, which ironically is about two women who get rid of the old and embrace the new. It was such an appropriate movie for the time. Geez, that dounded really cheesy but...it wasn't planned. The one thing I miss the most from 2008, though, is the fact that Blockbuster had so many movies. I used to go there after school lots and raid the drama section, because that's where all the classic movies were. We used to have Memento and Requiem for a Dream and movies like that. That year they started to clean out the store, and all of those movies disappeared. I would give anything to go back to that. Anything in this world. Yeah...2008 gets me really nostalgic sometimes. Such a great year. What is a film experience that changed your life? I was dux of my primary school (back in 1986). Not that it's ever done me any good, mind you. "Are you going to be talking about Heath Ledger on the show tonight?" It is interesting how technology has shaped the way we get news. I remember when the Aurora tragedy happened one of my friends hadn't heard about it until the next day when I told him, because he hadn't watched/checked the news. Now people just expect you to know about it the second the story lands. I remember the moment when my class mate told me that Ledger had died since he knew I was a movie person and all. I hadn't been online in the morning, nor did I see it in the evening so when he told me I didn't believe him. I just thought he was mocking me yet the choice of actor was a shock - how would he know one of my favorite actors and why would he make that kind of a joke? Got home. Internet. No joke. I cried, yes, I cried like a damn little girl and I was in the 12th grade for crying out loud! But.. I was a fan, he was the first movie person I ever loved in more than a normal way and now as my void is being filled with JGL and others, I still get teary when I read something about Heath. Oh. What a sad year it was. I cried, too! It was so sad. I thought they meant someone else, too. It was a really sad year. I heard of Ledger's death on TV. Mind you at that time, I wasn't devoted to movies so his name processed in my mind but it didn't really click. It sure as hell did when I saw The Dark Knight several months later. On a similar note, when Paul Newman died several months after Ledger, I just felt sort of guilty for having not seen any of his movies when he was still alive. That of course changed the following year...which I'll talk more about on the next post. I think that was the case for a whole lot of people. So sad. I felt exactly the same about Paul Newman! Oooh me likey James Marsden too, he's just sooo easy on the eyes but I read he's a nice guy, too. I read in IMDb that he still flies economy with his family as he doesn't want his kids to think actors are so special. It's rare to find a talented and gorgeous actor who's this down to earth. I'll rent 27 Dresses just for him then, though I can't stand Katherine Heigl! James Marsden is just the sweetest man! And he was sweet in 27 Dresses, too. That film wasn't actually all that awful. A part of me still can't believe Ledger's gone. It's the same with Harris Savides. They were so talented, and their deaths just came out of nowhere. A film experience that changed my life was The Seventh Seal. Until I saw that film, I hadn't experienced very many art-house films. It completely changed my taste in movies, and it showed my a whole other side of cinema that I'd been missing. I know! It is so sad. I still must see The Seventh Seal - maybe it might have the same effect on me! I totally agree with you! It has never made sense to me, and it has made me dial down my passions a lot. I've always been kind of ashamed of my passions because of those teachers, but I'm slowly getting out of that rut. Hey, Nathan Fillion is probably one of the coolest guys on Earth! Ledger's death was a huge, damaging blow. I hadn't seen much of him back then, but of course I had seen Brokeback Mountain so it was stunning that such a great talent had been lost so abruptly. Excellent post in a great series! I remember how sad I was when Ledger died, but I don't remember where I was, or what I was doing :( I think it must have just been watching the news one night. I had a great media teacher who used to show us great films in class, and my lit teacher was good for that too - thanks to him I saw Grave of the Fireflies, and my media teacher introduced us to American Beauty!